Pinkerton's extraordinary 1818 map of the British Possessions in North America. 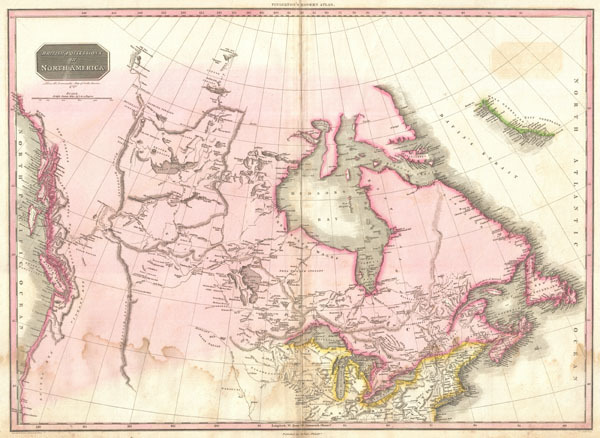 Based on Arrowsmith's historic map of North America, this map covers the continent north of the 40th degree of latitude, including all of the territory currently claimed by Canada. This fascinating map follows roughly 100 years of vigorous exploration of this region by adventurers in search of a navigable river and lake route from the Great Lakes to the Pacific. And yet, even after all of this exploration, much of the territory remains vague and uncertain. Details numerous river systems and lakes, some real, some fictional, between the Hudson Bay and the Rocky Mountains. Offers copious notations throughout, such as 'great quantities of coal in this creek' and 'Knistineaux war route.' Shows the Missouri River as far as the Mandan settlements where Louis and Clark wintered. Though the official narrative of Louis and Clark's historic journey had not been published when this map was in production, it is possible that Pinkerton had access to some preliminary accounts. Names several sightings of the Arctic Sea, far to the north, by the explorers Mackenzie and Hearne in the 18th century. The west coast, including Vancouver Islands, is particularly well mapped. Also notes numerous American Indian nations including the Knisteneaux (Cree), Blood, Cattanahowes, Snake, Assinpolls, Snake, Atnah, etc. Good condition. Mild to moderate damp staining in lower quadrants Original centerfold. Blank on verso. Rumsey 0732.046. Phillips (America), p. 195. Phillips (Atlases) 724. National Maritime Museum, 409.